Please Help Bring Gastin, Gabou, & Gabriel Home! The earthquake in Haiti was just over two years ago...but the effects of its devastation still linger today. Gastin, Gabou, & Gabriel are nearly eight year old triplets living at the Maision de Enfants De Dieu Orphanage in Port A Price Haiti. They have four other siblings living in Haiti with their parents. They were given to the Orphanage by their parents due to extreme poverty when they were 3 years old. That's where the Pyle family has stepped in. Chris & Joanna Pyle of Ligonier, IN, are willing to adopt these three boys, keep them together and raise them in a way that they will one day want to go back to Haiti and help those less fortunate. The Pyle's have met with the boys birth father. He stated that he and the boys mother want them to be adopted by a loving family in the USA to have a better life. Their hope for their boys would be that they would come to the USA to learn and when they are older, they could possibly go back to Haiti and help their people. After talking with boys father, the two men shook hands and agreed that the two families have much in common and he gave the Pyle family his blessing to adopt his boys! The families agreed that they would be like one giant family. 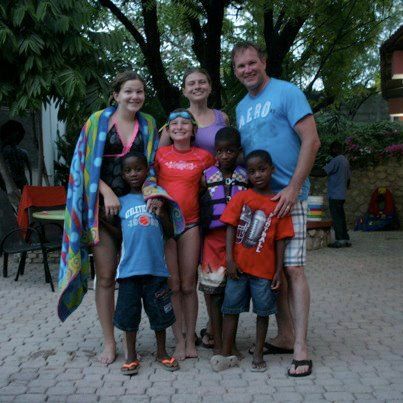 They have been waiting for 4 1/2 years to be adopted into their forever family. Learn more about their lives and their journey to become a family. While the love and support to bring the triplets home is great - so is the cost. The estimated cost for the adoption is $36,000. Your contribution, no matter the size, can help bring these sweet boys home to a safe and loving environment. Spread the word and make a donation - together we can bring these little boys home.